Which fast food hamburger joint has the best coffee? We've all been there – on a road trip at 8pm with nothing but dark skies and fast food restaurants in front of us. Where should we stop for a cup of coffee? Which QSR spot has the best joe? By correlating spontaneous consumer conversation to sales data, our SIGNUM for Restaurants platform offers two ways of approaching the question, both extremely revealing. The first approach simply asks: Which cup of coffee is most popular with customers? The answer is McDonald's coffee. We limited our query to major American hamburger QSRs that serve coffee. 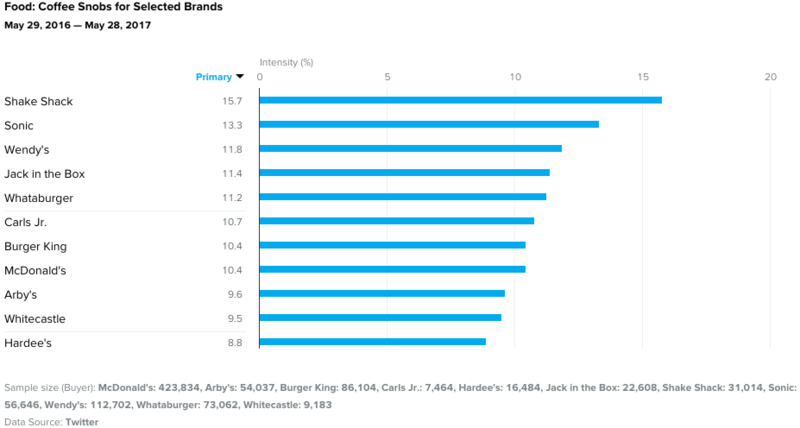 * McDonald's customers talk about its coffee the most, with a predominantly positive sentiment; Jack in the Box comes in second. Interestingly, both chains offer all-day breakfast. One can therefore reasonably conclude that if you want more people to drink your coffee you should offer food around the clock that people enjoy pairing with coffee -- like eggs and sausage patties. The graph above proves that a lot of people drink McDonald's coffee and a lot of people like it. But what about quality? After all, a lot of folks seem to like receiving socks for Christmas but wouldn't some rather get a vacation to the South of France? Stated more clearly: What do coffee snobs have to say about all this? Luckily, SIGNUM for Restaurants has an Interest Group called exactly that, Coffee Snobs. And those snobs have an interesting story to tell. Coffee Snobs are defined by the platform as people who follow one of dozens of premium coffee handles on Twitter including Blue Bottle, Philz, and other high-brow cups of java. 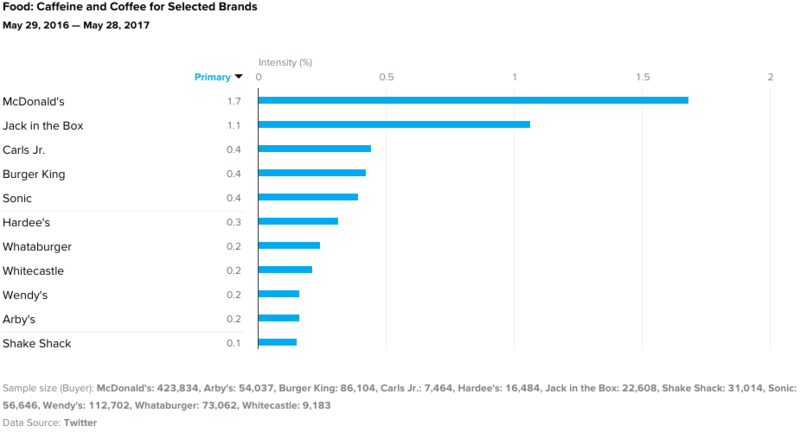 A full 15.7% of Shake Shack's customers fall into that category, which shouldn't be a surprise since most of the chains are located in big metropolitan areas like New York City where people are less hesitant about spending $4 for a cup of coffee. There's a big potential takeaway here for a chain like Sonic that doesn't actively promote its coffee. Sonic clearly has the attention of coffee snobs and could up-level its caffeine offerings beyond mid-market Green Mountain. Something about the food at Sonic is attracting people with discerning coffee palates; there are definitely opportunities for LTOs and promotions when it comes to pairings. Maybe they should advertise during Portlandia. Maybe all their television ads should feature more coffee. Maybe they should come out and brand their cups "the best coffee on the road." The possibilities are many. Curious which competitors are pouring hot water over your business? Want to know who’s driving your revenue, and how to drive more? Quantifind can extract the signals you need from your data today. (*) Five Guys, Smashburger, and In-N-Out do not serve coffee.